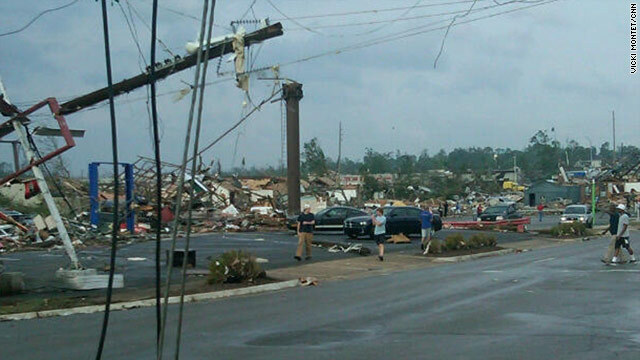 Organizations are at work providing food and shelter to people in places such as Tuscaloosa, Alabama, above. (CNN) -- The severe storms and tornadoes that ripped through the South and Midwest killed at least 327 people, making it the third deadliest outbreak in U.S. history. Alabama was the hardest-hit state, with violent storms taking the lives of at least 249 people in 19 counties. Now massive flooding in Southern and Midwestern states has prompted authorities to order more evacuations near the Mississippi and Ohio rivers. Floodwaters continue to rise, inundating farmlands, highways and homes. As organizations and first responders offer emergency relief, food and shelter, many people across the country are looking for ways to help disaster victims. The Salvation Army is providing food, drinks and emotional support to tornado victims in several states, including Alabama, Mississippi and Georgia. The organization has served 86,000 hot meals, 260,000 sandwiches, snacks and drinks. The group has provided more than 54 mobile feeding units, a field kitchen and a shower unit. It is also distributing groceries, baby diapers and formula, and general hygiene products. In Arkansas, where rivers continue to swell, the Salvation Army is supporting the community of Pocahontas. A mobile feeding unit is providing three meals a day, and the group is handing out cleaning, hygiene and baby supplies to flood victims. The organization also is serving meals to about 200 National Guard soldiers deployed along the White River. Follow the Salvation Army's blog for updates, visit its website or text "GIVE" to 80888 to make a $10 donation to the organization's relief efforts. It will show up on your next mobile phone bill. Samaritan's Purse dispatched two disaster relief units -- tractor-trailers stocked with emergency supplies and tools -- to serve as command posts for staff and volunteers helping tornado victims in Tuscaloosa, Alabama, and near Birmingham. The organization has had more than 2,550 volunteers join the relief efforts in Alabama. Volunteers are clearing debris, putting tarps on roofs and helping homeowners salvage their personal belongings. Visit Samaritan's Purse online to volunteer or make a donation to help the storm victims. The American Red Cross is helping tornado victims recover by providing food, shelter and essential relief supplies such as hygiene kits, work gloves, tarps and coolers. More than 1,240 tornado and flood victims spent Wednesday night in 64 Red Cross shelters in states throughout the South and Midwest. The Red Cross operates a National Shelter System Google map, where people can find information about shelters in their area. In Alabama, 62 emergency response vehicles are traveling through neighborhoods to provide supplies and hot meals to families in need. Text "REDCROSS" to 90999 to make a $10 donation, or visit the website to donate, give blood or volunteer. AmeriCares is delivering bottled water, medical aid and other critically needed supplies to communities across the South. The organization is sending medicines and medical supplies to clinics in Arkansas and Mississippi, treating tornado survivors without health insurance. AmeriCares is also working with Feeding America and Nestle Waters North America to deliver more than 265,000 bottles of water to food pantries and shelters in Alabama and Tennessee. Donations to the group's U.S. Disaster Relief Fund will support relief efforts in the South. To donate, go online or call 1(800) 486-HELP. The United Way supports agencies such as the American Red Cross and the Salvation Army to be on the front lines of tornado relief efforts. Go online to donate to the United Way's Tornado Disaster Fund, call 1-855-205-HELP or text "TORNADO" to 50555 to donate $10. Visit the website for drop-off locations to donate items like bottled water, diapers and flashlights. Convoy of Hope's disaster response team, with the help of volunteers, is providing food, water and supplies at distribution sites in Birmingham and Tuscaloosa. More than 1 million pounds of supplies have been handed out or are ready to be delivered to affected areas. Visit the organization's website to find out about volunteer opportunities or to make a donation. Feeding America mobilized a quick-response team to get food and water into the hardest-hit areas in eight states and is working with Alabama-based food banks to coordinate its efforts. The organization provides disaster relief food items, including ready-to-eat meals and bottled water, to victims and relief workers. Go to the website to make a donation to help food banks provide meals to communities affected by the tornadoes. Save the Children has distributed truckloads of shoes, diapers, portable cribs and toys to more than 1,100 children in hardest-hit Tuscaloosa and Smithville, Mississippi. The organization is working with the Gilmore Foundation to set up a child-friendly space/emergency child care program for nearly 200 children in Smithville. Donations to the group's Southern U.S. Tornado Children in Emergency Fund will support the ongoing needs resulting from the devastating tornadoes. World Vision dispatched a mobile distribution unit, which will provide emergency relief supplies such as hygiene kits, kids' shoes, batteries and flashlights for up to 500 people in Alabama. The organization will also be sending a semi to Alabama with 26 pallets of relief supplies, including shoes, clothing and cleaning materials. Donations to the group's Disaster Response in the USA fund will provide emergency supplies to those in need. Text "TORNADO" to 20222 to donate $10 to the fund. ShelterBox is sending a response team to the tornado-ravaged areas in the South to determine need for temporary shelters and to lend a hand where needed. The organization provides emergency shelter and warmth to people displaced by disasters. Each ShelterBox includes a tent for up to 10 people, a stove, blankets and a water filtration system, among other tools. General donations can be made online, by calling 941-907-6036 or by texting "SHELTER" to 20222 to make a $10 donation. In Alabama, the Governor's Emergency Relief Fund helps residents, businesses and organizations when other avenues of relief have been exhausted. Visit the website to donate to the fund, or call 211 (in Alabama) or 1-888-421-1266 for volunteer information. Direct Relief USA is working with partners across the Southeast to supply them with the medical aid they need for patients and people affected by severe storms and tornadoes. Donations can be made on the website. WhyHunger operates a National Hunger Hotline to help tornado victims. The hotline refers people to local aid and connects those who are having difficulty reaching their local food banks due to landline phone outages. If you or someone you know needs help, call 1-866-3-HUNGRY to get a referral for emergency food, shelter and government benefits nearby. LifeSouth Community Blood Centers is declaring "there is an emergency blood shortage" in Alabama, according to J.B. Bowles, vice president of operations. The organization typically carries 3½ days worth of blood, but the storm almost exhausted its stores, Bowles says. The centers are nearly out of O-negative (universal donor) blood and are having to ship emergency supplies from out of state. Visit the website for information on how to donate blood. The Billy Graham Rapid Response Team of crisis-trained chaplains has staff in Birmingham assessing the damage. The group, which deployed in coordination with Samaritan's Purse, will address the emotional and spiritual needs of tornado survivors in and around Birmingham and Tuscaloosa. Those wanting to help the response team in Alabama may text "RRT" to 85944 to make a $10 donation. Hands On Birmingham is preparing to organize volunteer groups to help in affected areas once the search and recovery efforts have concluded. To find out about the group's volunteer opportunities, call 205-251-5849 or visit the website. A Facebook match-up page has popped up to reunite owners with tornado-strewn items such as photos and documents. Visit the Facebook page to search for lost items or post pictures of things found.